Today I am publishing a new Position Paper from the Una Voce Federation (FIUV), on the Kiss of Peace: go over there to read it. The reform of this little ceremony exemplifies the 'archaeologism' of the reformers: their attempts, at least in some places, to resurrect long-extinct texts and rubrics. 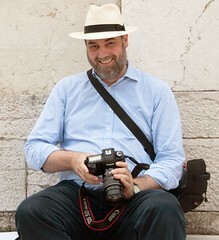 It also exemplifies the problems with such archaeologism: its dependence on the limited scholarship of half a century ago, its ability to miss the most crucial point about a ceremony, and its refusal to understand the good reasons why, under providence (not thanks so some know-it-all committee), change happened, gradually, over the course of the centuries. First, yes everyone did exchange the kiss of peace in antiquity. 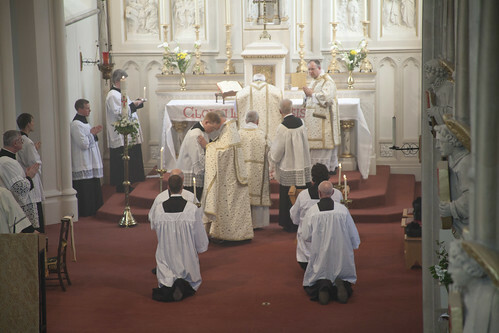 The reformers saw that this took place earlier, at the Offertory, in the Gallican Rite, and there was a widespread idea (see the scholars Gregory Dix and Josef Jungmann) that the Roman Rite moved the Pax from that position to its current one before Communion, at some point prior to a famous letter on the subject written by Pope Innocent I in 416. This is an example of scholarship getting ahead of itself, however: there is not a scrap of evidence that it ever took place at the Offertory in the Roman Rite (or in the closely associated African liturgical practice). This is important for the meaning of the ceremony. At the Offertory, the key to it is the reconciliation of the Community, an idea which appealed to Bugnini and his gang in the 1960s. But in the Roman Rite, while this idea is not absent, there is something else which sets it into a bigger context. The Peace is on the Altar. Christ, the Prince of Peace, has come down upon the Altar, and it is His peace which is imparted in the Kiss. So it is not just exchanged between members of the congregation: it is given to them from Christ. 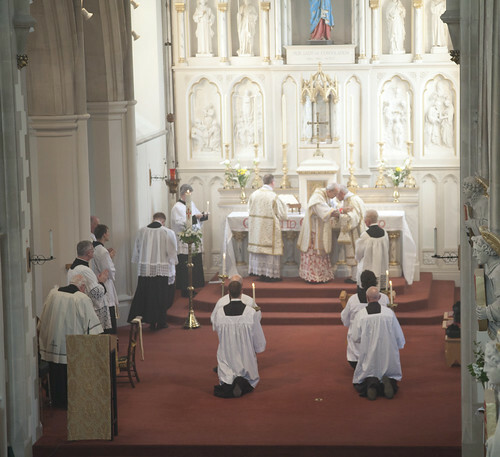 The celebrant kisses the Altar next to the Consecrated Host, and it is this kiss, exchanged with Christ, which is passed on, one by one, to the rest of those present. This is done with the very beautiful ceremony of the 'embrace', first to the deacon, then the subdeacon, then the MC and so on. I was delighted to hear that in Spain and her former Empire this can be passed on to the congregation with a 'paxbrede', a physical object (usually a small silver disc with a handle), as was done in Medieval England. Elsewhere, for practical reasons, the participation of the Faithful in the ceremony has, since the end of the Middle Ages, become purely spiritual. 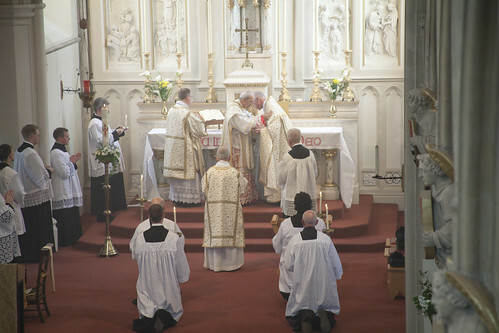 The passing on of the Peace from the Altar has been completely lost in the current ceremony--if we can call it that--in the Novus Ordo, where everyone simultaneously shakes hands with everyone else. 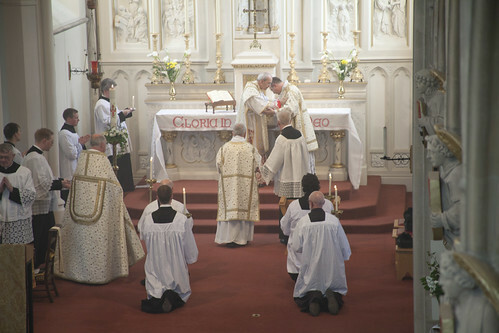 Speaking personally, I am always moved to see the ceremony of the Pax at Traditional High Mass; I think it is one of the most symbolically eloquent ceremonies in the Mass. It is an example of something which really works. Those arguing about what to do about the Sign of Peace in the Novus Ordo should bear that in mind.